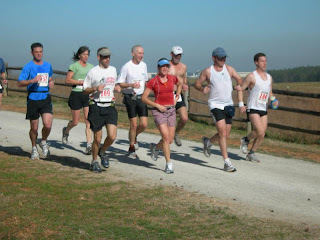 I'll be running the 4th Annual Umstead Trail Marathon this Saturday Morning. The photo was taken last year in the early miles. We had some freaky warm weather last year. Earlier in the week it had been about normal for March with lows in the 30's and 40's and with highs in the 50's. It would hit 81F on race day. Times were slower than normal and I had a miserable race since I had not acclimated to the warmth. Still had fun hanging with friends. I had run the first year and hoped to run the 2nd but I thought I had a prior obligation. It turned out I was free but the race was full so I went and volunteered that year. This will be my 3rd and I hope to run my best time but my recovery from a hard February of racing will have a lot to do with that. Looking forward to seeing a lot of good running friends again this year. It's special to have a race in my favorite training playground. You can check out the race website here. Last year my special friend Laura MacLean won the womens race and she will be back to defend her title. Another special lady, Margherita Scott who was part of my Boston qualifying effort last year will be running it for the fourth time and has finished 1st and 2nd in her age-group in previous years.